A popular choice of drink for many, with winter firmly upon us and the start of Christmas parties commencing, we want to teach you how to make this Cuban classic. 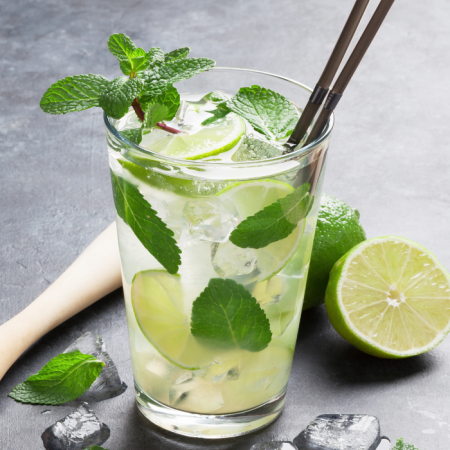 Whether enjoyed in the sun or cuddled up under a blanket, a mojito can be enjoyed at any time of the year. Made with only 6 key ingredients, all you need is: white rum, brown sugar, lime juice, mint, soda water and Ice. Take half a lime and cut it into four wedges. Place 2 of the lime wedges with 2 tablespoons of brown sugar and 10 mint leaves into your glass and crush with your muddler until you have formed a mixture of juice at the bottom of the glass. Add the last 2 wedges of lime before adding some ice and pouring a shot or two of white rum over the top. For those wanting to be a bit more adventurous with their mojito, adding either passionfruit, strawberry or grapefruit can add a hint of sunshine, bringing back memories of the summer. If you are wanting a fruity alternative to this citrus drink, make the mojito the same way, swapping the lime for the chosen fruit.